Oz Lotto is one of Australia’s most popular lotteries — with good reason. There’s a lot to like here: jackpots rollover to the next drawing when no one wins in the current draw, jackpots start at $2 million, and the odds are pretty good compared to bigger lotteries. The best part is that it’s among the easiest-to-understand lottery games out there—both newcomers and veterans alike will no doubt love it. Sounds right up your alley? Join me as I take a closer look! 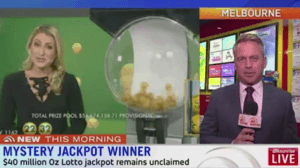 Oz Lotto began all the way back in February 26, 1994, when it was introduced as Australia’s very first national game (at the time, New South Wales was not part of Saturday Lotto). Speaking of its competitor game, Oz Lotto started out with similar mechanics as Saturday Lotto wherein you pick six numbers from 1-45. However, in October 18, 2005, they changed the mechanics so that a seventh number would have to be drawn, which lengthened the odds of winning the jackpot. For a time, Oz Lotto came to be known by different names depending on the region to reflect the change in mechanics. In regions where the Tatts Group runs the game, it was known as Super 7’s Oz Lotto, while in Queensland it was known as Oz 7 Lotto. In 2012, however, the game has since reverted back to simply being called Oz Lotto in those regions. Rollover Lottery: Oz Lotto’s jackpots roll over when no one wins—making the next prize fund even bigger. Minimum Jackpot: The minimum prize pool of each Oz Lotto drawing is $2 million. Relatively Good Odds: Compared to some lottery games, Oz Lotto’s odds are pretty good. Easy, Straightforward Game: Oz Lotto is an easy, no-frills game—just about anyone will be able to grasp it in no time. Tax-free: If you play and win in Australia, your prize is considered tax-free income. However, if you play elsewhere, your local tax laws may apply. Draws: Oz Lotto draws are held every Tuesday. How Does Oz Lotto Work? Oz Lotto is, as I’ve mentioned before, a very easy and straightforward lotto game. You simply choose seven numbers from a selection pool of 1-45, and to win the jackpot you must match all 7 numbers. Matching less numbers still nets you prizes, though you need to match at least 3 main numbers and 1 (or 2) supplementary numbers to win in the lowest prize tier (aka “division”). It’s that simple! Although Oz Lotto’s mechanics are pretty simple, that doesn’t mean there’s no depth or variety. They also offer a feature called System Entries, which give you the possibility to win in multiple prize tiers/divisions using just one entry. Basically, System Entries allow you to pick up to 20 numbers in a single entry—wherein the numbers you chose can be made into multiple combinations consisting of 7 numbers each. To put it more simply, it’s like playing in several standard games, but using only one entry. So, for example, if you choose the System 9 option—where you can choose a total of 9 numbers—it’s like playing 36 standard games. Take note, however, that not every lottery site offers this feature for Oz Lotto. If you live in Australia though, then you can easily take advantage of their System Entries feature. Much like their game mechanics, winning Oz Lotto is fairly straightforward, too. For prizes less than $1,500, you can head on over to any Tatts Outlet—in either Tasmania or Victoria (wherever jurisdiction you bought your ticket). Meanwhile, if you bought your ticket in the Northern Territory, you should go to any Tatts Outlet in that area. Meanwhile, claiming winnings over $1,500 at any Tatts Outlet is a bit more complex. For starters, winnings that range from $1,500-$3,999.99 could be paid out immediately or, if not possible, the outlet itself could make other payout arrangements—though it is at their discretion. Prizes ranging from $4,000-$24,999.99, meanwhile, will be paid out—at the discretion of the outlet—after getting authorization from Tatts proper. You can also lodge a claim either via mail or in person (through Tatts’ Victorian Office), though take note that prizes will be paid out within 10 business days upon receiving your claim. A man, who had been playing the same numbers for years, won the AUD$20 million jackpot by accident. Supposedly, he had mistakenly filled out numbers one line below his usual picks—which was very fortuitous for him, it turned out. In 2013, a whopping 448 millionaires was estimated to have been produced by Oz Lotto. On July 18, 2017, there were 3 winners of the AUD$50 million jackpot. One of which, a man from Manly, hung up on lottery officials who were calling to notify him of his big win. Luckily for the man, the officials persisted! Could YOU be the next Oz Lotto winner? Whether you’re from Australia or elsewhere in the world, if you want a simple, straightforward lottery game, Oz Lotto might just be right up your alley. Its mechanics are ridiculously easy to understand, the odds aren’t half bad, and you can get more chances of winning using a single entry via the System Entries feature. Plus, if you’re a native of the land down under, Oz Lotto winnings are considered tax-free income. Sure, the jackpots may not be as big as more popular mega lotteries, but with a minimum of $2 million per draw, they are still pretty sizeable.